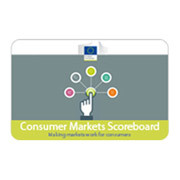 The Consumer Scoreboards monitor how the single market is performing for EU consumers and signal potential problems. Published since 2008, they aim to ensure better monitoring of consumer outcomes and provide evidence to inform policy. Scoreboard findings are used by national policymakers and stakeholders to assess the impact of their activities over time and benchmark the situation against other Member States. Scoreboards also serve as a key reference for evaluations and impact assessments for policy development and orientations, including in the context of the European Semester.